Brazil Dupla Sena is one of Brazil’s hottest lotteries, and its unique twist is one of the main reasons it’s so popular: each of the draws that take place every week is actually a dual draw—meaning your numbers have two rather than just one chance to win! Though the jackpots start at only R300,000 (€71,030), they escalate quickly because there are three draws each week and no cap on rollovers. But what else does Dupla Sena have going on? 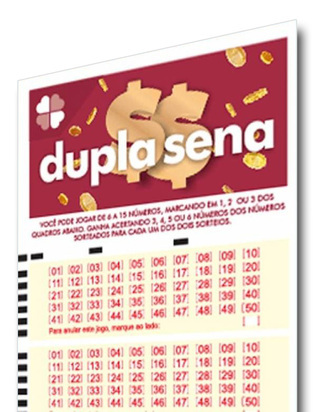 Dupla Sena was introduced onto the Brazilian lottery scene in November 2001 by the same operators who run the Mega Sena and Quina lotteries: Caixa Econômica Federal, which is one of the largest banks in the country. 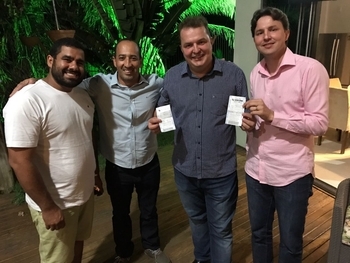 As those lotteries were enjoying great success among Brazilian nationals, the company wanted to create a new lottery that would offer something different—and having a lottery that held not one but two draws per draw is what they came up with. “Dupla” in Portuguese means “double,” which is the perfect name for this unique lottery. 33% of the proceeds that Caixa earns from Dupla Sena go to various government organizations, mostly sports-related. Playing Brazil Dupla Sena is very easy, as all you need to do is choose 6 numbers from a range of 1 to 50. You can also opt to have numbers chosen randomly for you. If all your numbers match the set of numbers that are drawn in either the first draw or the second draw (which takes place immediately after the first one), you win the jackpot. If a jackpot is not won, it simply rolls over to the next draw and will continue doing so until somebody finally wins it. Since the odds aren’t bad and since there are three draws per week, this usually doesn’t take too long to happen. The odds of winning the jackpot in either of the dual draws are the same: 1 in 15,890,700. These odds are fairly good as far as international lotteries go. Compared to Dupla Sena’s big Brazilian brother, Mega Sena (1 in 50,063,860), they are more than three times better—but let’s not forget that Mega Sena’s jackpots can be more than 10 times bigger. Lotteries that offer slightly better jackpot odds are Lotto 6/49 and Spain Bonoloto, both of which give players a 1 in 13,983,816 chance of winning. Meanwhile, Hungary Hatoslottó (1 in 8,145,060) has similar jackpots prizes and considerably better odds. However, when you factor in that each Dupla Sena ticket actually gets you into TWO draws, it’s like the odds are basically split in half anyway. Dupla Sena’s draws are held three times per week on Tuesday, Thursday, and Saturday nights at 8 pm BRT. However, since two draws take place on each date, it’s like there are six draws each week in total! If you are fortunate enough to win one of the Brazil Dupla Sena jackpots, you’ll have a choice of getting your winnings as a lump-sum cash payment or in annuity instalments spread out over an agreed-upon term. While the annuity option could result in you paying less taxes overall, it’s probably better to just take your money and run with this lottery. After all, the jackpot amounts aren’t crazy ones worth hundreds of millions, so they’re generally a lot easier to manage and keep a cool head about. If you win a prize in a Dupla Sena draw, your winnings may be taxed a little or a lot. This depends on the amount you actually win. If the windfall is less than R$1,868 (€442), then you’ll only need to pay a 13.8% federal tax. However, if you win more than this, you’ll need to pay another 27% tax in addition to the 13.8% federal tax—which adds up to just over 40% in total. If you happen to live in a country that also taxes lotto wins, then you could be taxed even further when transferring the money into your home bank account. Therefore, it might a good idea to do your research on this before playing. If you live outside of Brazil and don’t have any plans to visit it any time soon, you can still get in on the Dupla Sena action through one of several online lottery websites. Many of these sites will actually purchase an official, physical lottery ticket for you and scan it so that you can access it within your player account, while other sites will allow you to bet on the outcome of the lottery—with identical prizes, odds, and everything else. The fee for playing through these convenient sites is usually only a little bit extra over what the official ticket would cost, making the decision to play through them a no-brainer. Brazil Dupla Sena – Is It Worth Playing? With its unique format and pretty good odds, Dupla Sena offers a lot of value for a cheap price. Though its jackpots, especially after all the taxes are deducted, aren’t the kind that would ever make headlines across the world, they would still make pretty much any winner leap with joy. As a result, we believe Dupla Sena is ultimately worth checking out. After all, even the world's best lotteries don't give you two chances to win with just a single ticket! Great lottery... lots of fun.. very much enjoy the double draws it has!